FILE - In this May 24, 2018, file photo, people watch a TV screen showing file footage of U.S. President Donald Trump, left, and North Korean leader Kim Jong Un during a news program at the Seoul Railway Station in Seoul, South Korea. A new U.S. intelligence assessment has concluded that North Korea does not intend to give up its nuclear weapons any time soon, three U.S. officials told NBC News — a finding that conflicts with recent statements by President Trump that Pyongyang intends to do so in the future. President Trump is continuing to pursue a nuclear summit with North Korean leader Kim Jong Un even though the CIA analysis, which is consistent with other expert opinion, casts doubt on the viability of Trump's stated goal for the negotiations, the elimination of North Korea's nuclear weapons stockpile. 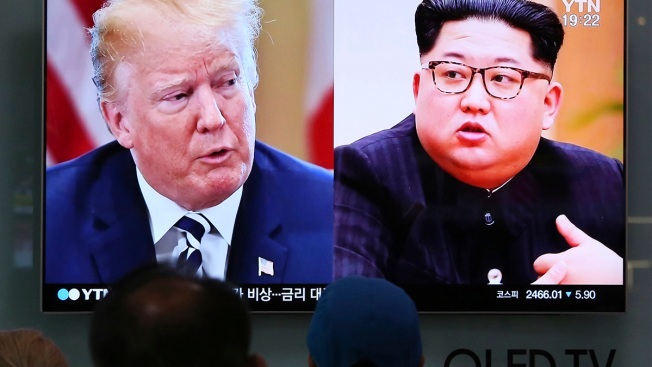 "Everybody knows they are not going to denuclearize," said one intelligence official who read the report, which was circulated earlier this month, days before Trump cancelled the originally scheduled summit.